Facts about Ochlerotatus Mosquitos, "Scientific name Ochlerotatus Mosquito is Ochlerotatus". Ochlerotatus mosquitoes belong to the genus Ochlerotatus Lynch Arribálzaga. There are sevarl species under this genus and according to research 197 of those species have been identified. There are 13 subgenera that are associated with 73 species while the 123 species are without any sub generic placement. The sub-family of the Ochlerotatus mosquitoes is identified as Culicinae while the tribe is Aedini. The Ochlerotatus Mosquito are highly varied in terms of species but they exhibit some specific characteristics. The adult Ochlerotatus Mosquito have narrow decumbent scales, interocular space which can either have scales or not and compound eyes that are separated above the antennal pedicels. The female Ochlerotatus Mosquito have a shorter antenna while the males have a proboscis that is distinctively shorter than the females. The larvae have a broad head and short antennae that vary with the species. Many species that are contained in Ochlerotatus Mosquito cannot be exactly placed in particular subgenera because of significant structural and morphological differences. The affinities between the species is Ochlerotatus is not very strong but some sister species exhibit some close relationships. The Ochlerotatus Mosquito have most of their lifecycle in aquatic environments mostly fresh water ground pools. However, there are species that have been known to inhabit rock holes, brackish water pools and artificial container habitats. The female Ochlerotatus Mosquito attack humans causing a lot of trouble. This is particularly the case in the northern temperate regions. Many of the species in Ochlerotatus bite even during day time but others wait until night time because they are nocturnal. An average Ochlerotatus Mosquito life is less than two months. The Male Mosquito usually only lives about 10 days or less, while female Ochlerotatus Mosquito can live about six to eight weeks. Female Ochlerotatus Mosquito can lay over 250 eggs at one time ever 3 days, for every milligram of human blood, the Ochlerotatus Mosquito can lay an average of about 40 eggs. Hatching eggs will hatch into larvae in about 24 to 48 hours. Larvae soon grow to about (5 mm) in length. The eggs are deposited most of the time in clusters called "rafts", on the surface of flooded areas and stagnant water as little as one inch. The female Ochlerotatus Mosquito will lay eggs about three times before they die. A Ochlerotatus Mosquito doesn't have teeth. 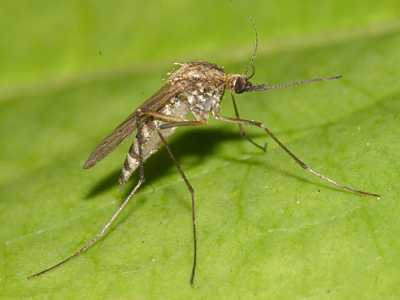 The female Ochlerotatus Mosquito bites with a long, pointed mouth-part called a "proboscis". The mosquito have pointed mandibles - meaning either half of a crushing organ in an arthropod's mouth-parts, as well as maxilla that are used when the mosquito locates a capillary, then draw blood through one of two tubes. The female Ochlerotatus Mosquito zeros in on its victim using a combination of chemicals in the person's sweat, exhaled carbon dioxide and animal or human scent. They use the serrated proboscis to pierce the skin and locate a capillary, then draw blood through one of two tubes. Only a female Ochlerotatus Mosquito will bite a human. Both female and male Ochlerotatus Mosquito feed mainly on plant nectar and fruit, the female needs the protein in blood to help the female to develop their eggs. There is a couple of resting days before the female Ochlerotatus Mosquito will lay the eggs. Most of the Mosquitoes are crepuscular- meaning appearing or active in twilight or dawn. Ochlerotatus Mosquito can drink blood up to three times its weight. It would take over a million bites to drain all the blood out of your body. The Ochlerotatus Mosquito spends their first 10 days in water, which is mandatory for the eggs to hatch into larvae, named wigglers. The stagnant water is where the wigglers feed on organic matter and breath oxygen from the surface. Than the Ochlerotatus Mosquito develop into pupae, which do not need to feed and are partly encased in cocoons. In a few days, the pupae will change into a full grown Ochlerotatus Mosquito. There are on average about 175 species of mosquitoes in the United States and more than 2,800 species of mosquitoes in the rest of the world. "Scientific name for Masquito is Culicidae". The word Mosquito is Spanish for "little fly". The word Mosquito its known origin is from the early 16th century. Mosquitoes in Africa are named "Mozzies".